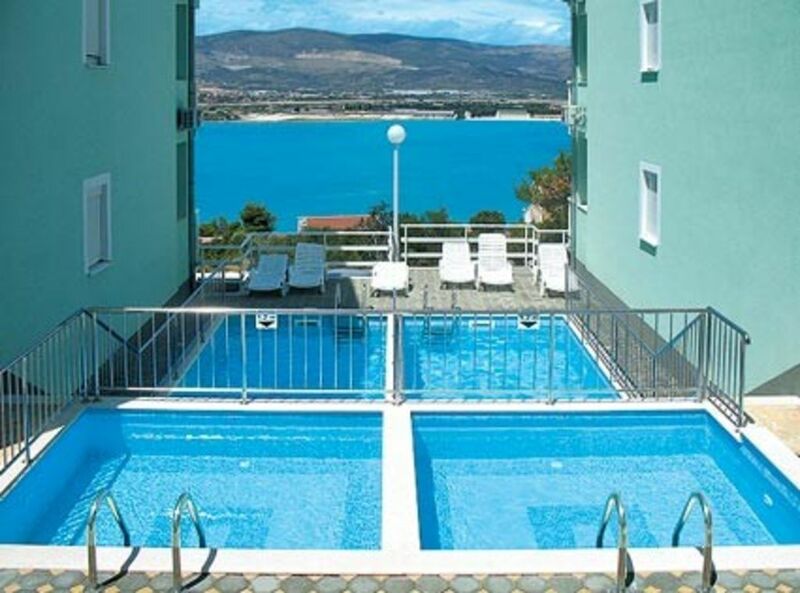 The romantic absolutely newly furnished apartment situated on a hill in the newly built Villa Bayview with a wonderful view of the sea and green surroundings. and living room with kitchen with sofa bed for 2 children or 1 adult. WC is modern with shower and the balcony has enough space for 4 +1 persons where you can really relax next to the wonderful sea view and relax. Through the ground floor you reach the beautiful garden setting with swimming pool where you have plenty of sun loungers and seating. In the apartment air conditioning, satellite TV, radio / CD player, speakerphone, security door. All in one place pool, ample parking, use of garden. This apartment is in a great location. Not far from Split airport and the centre of Trogir. The apartment itself was well equipped and clean and the views are simply stunning. The hill to the apartment is quite a challenge but it's all worth it and great exercise 😊. There is a supermarket and the beach within a few minutes. U can also get a boat to Trogir which is 20 kuna, very reasonable but we also walked it one day. U can find many beaches and restaurants within walking distance which is great. Hire and car and view the island of Ciovo, especially Laguna beach club. Thanks Miro and Nadia for a fantastic stay, we will recommend yr apartment to our friends who r thinking of visiting. Just 2 km kilometers away is the town of Trogir, whose historic old town is a real diamond and World Heritage Site, which is why it is also under the protection of UNESCO. There are the world-famous cathedral with the Portal of Master Radovani and Kamerlengo from the 15th century. Visit century as well as numerous museums and churches. The restaurants of Trogir satisfied with their offer of Mediterranean cuisine even the most discerning gourmet. The place Mastrinka on the island?iovo is equally suitable for a quiet family holiday, as well as for young people looking for a variety of leisure facilities. Near the apartments also different sports are available: a fitness center, tennis courts and diving school. In addition to jet-ski rentals can also daily boat trips to the nearby islands of Hvar, Bra?, Kor?ula and Vis are posted, and you can enjoy the many places still untouched nature. Other Activities: Quad-buggy ride, shoot paintball.